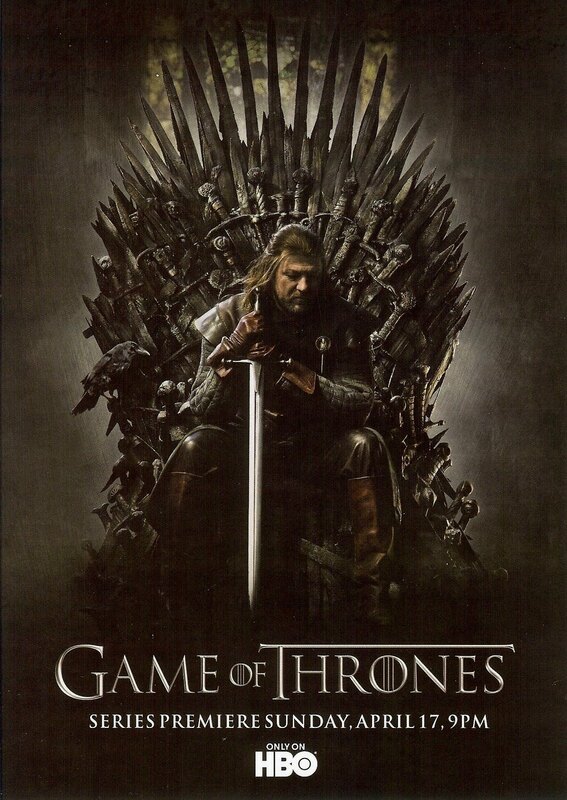 Yes, I know it's April but that means the premiere of Game of Thrones is only a few weeks away! In case you don't know, Game of Thrones is based on the novel series by George R.R. Martin. While I have not read the series, it grabbed my attention as a interesting fantasy series. Because it looks so interesting, I have delved into the Westeros, the world where winter can last for decades and everybody is after the Iron Throne. They released a fifteen minute preview, which gives us a glimpse into the world. We got to see some deserters from the Night Watch face an evil that has not been seen. We then got to see Lord Eddard Stark as he manages his kingdom and teaches his sons. While I would have hoped for a bit more detail, I really enjoyed the look and feel of the show. In case you missed it, here is the preview. What really sold me on Game of Thrones was the "Making Of" episode that was shown on HBO. The passion that executive producers, David Benioff and D.B. Weiss, feel comes out when they speak about the show. Both are fans of the book series. On top of that, they have the full support of Mr. Martin, and I always love when the creator supports an adaptation. It makes me feel like the characters' integrity is being protected. Did you know? Hash yer ray nesi? The name for the Dothraki people - and their language - derives from the verb "dothralat" which means to ride. The longest word in Dothraki is "athastokhdeveshizaroon," which means from nonsense. Can't wait for one of the actors to have to say that! The detail may be the show's downfall; the first episode synopsis was very hard to follow because I didn't know the characters. Based on what I have seen so far, I'm not overly concerned and once the show starts I am sure I will be able to delve right into this world. 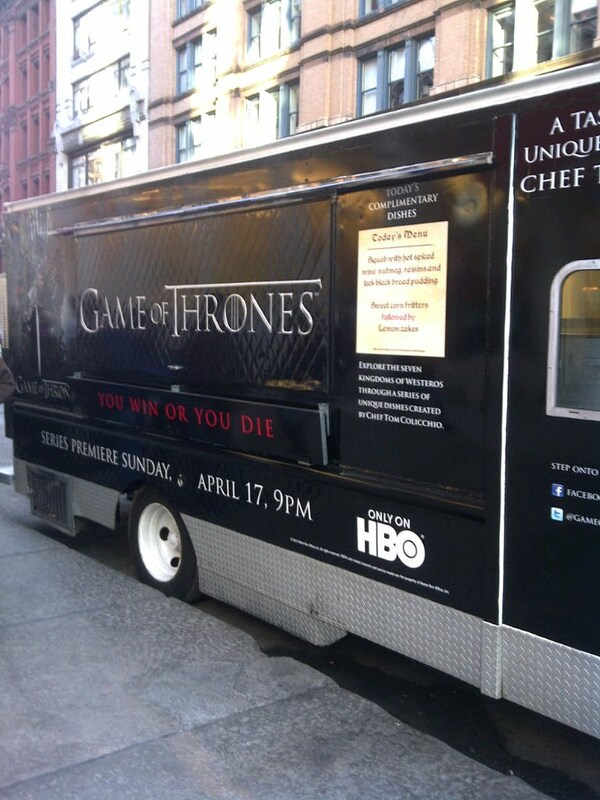 HBO has been everywhere promoting the show, so I am sure you have seen something about it. I really like how they are interacting with fans. They have a great online presence, including active Facebook and Twitter accounts. I have been lucky enough to to be involved with some of their outreach. 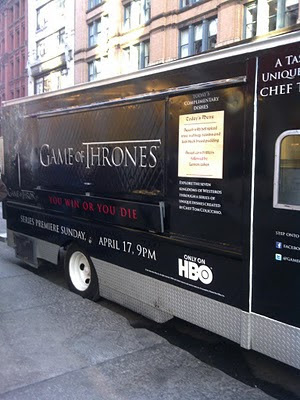 I was able to visit the Game of Thrones Food Truck while it was in NY. 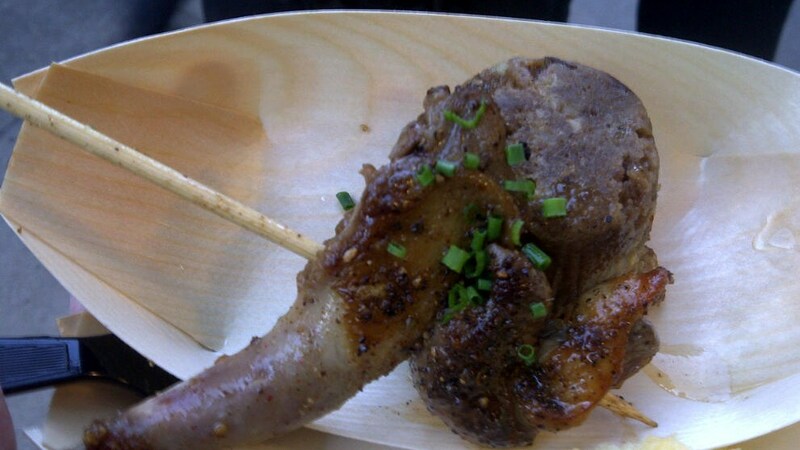 It was a fantastic experience to try food based on the show's culture. Each day they had a different menu of Westeros-inspired (really traditional English) food. The menu was designed by Chef Tom Colicchio. The day I went, I tried the Squab with Black Pudding and a Lemon Cake for dessert. Everything was fantastic, except the Black Pudding. I want to like it but I never have. If you don't know what Black Pudding is, consider yourself lucky. If you are in the LA area this week, try finding the food truck! Have you joined their online community? You can join one of the seven kingdoms of Westeros, play games to help your family beat the others or just betray your family and have the chance to win prizes! The games are kinda cheesy but it kept me entertained, plus I like the chance to win free stuff! So until the premiere on April 17th, I have plenty to get me psyched up for the show. I am even walking around and saying Winter is Coming in a serious voice. I can't wait for this show!